The Milbank City Council has approved raising the minimum height requirement for the pruning of tress which overhang residential sidewalks and public right of way areas within the community. At last (Monday) night’s meeting, the council approved the first reading of Ordinance 814, which outlines the proper maintenance of trees along residential streets. Under the ordinance, the minimum height clearance allowed for trees overhanging residential streets would be set at 14 feet with a minimum clearance of eight feet being required for trees that extend over public sidewalks. The city, in turn, would have the right to prune or remove any tree or shrub that fails to comply with the ordinance or may do so, as well, if it is determined that the fixture creates a potential safety hazard. Last (Monday) night, Mayor Pat Raffety also proclaimed the week of May 14th through the 18th as “Law Enforcement Torch Run for Special Olympics South Dakota Week.” The 2018 Law Enforcement Torch Run in Milbank on May 15th honors the Special Olympics athletes from Milbank who will be participating in the 2018 State Summer Games May 17th – 19th. A core group of runners from around the state will finish at the Game’s Opening Ceremony in Spearfish on Thursday, May 17th. 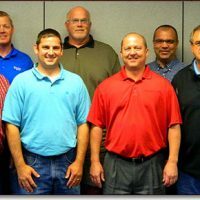 At last (Monday) night’s meeting, the Milbank Wastewater Department was also presented with the “2017 Operation and Maintenance Award” for providing outstanding service while also maintaining quality operational standards, as well. In other business, the council approved a special “Life Light” event being coordinated by Daryl Liebe this summer at Lake Farley Park. A family music festival type event is slated to take place at the park on Friday August 24th and Saturday, August 25th. The council also took action on several personnel issues. The council accepted the resignation of Mike Morgan as a city police officer, effective immediately. Council members also approved the hiring of Paige Frazee as a new part-time officer for the department at a starting salary of $17.50 an hour. The council also accepted the resignation of Angela Lambrechts from the city planning and zoning commission with city council member Joel Foster being named as an alternate to the commission. The council also approved the hiring of Jake Anderson, Tanner Gauer and Riley Wollschlager as seasonal employees for the city, effective immediately.